I’m always on the look out for RCTs relevant to emergency medicine and I have an automated search set up in PubMed to bring any to my attention (does everyone do this, or is it just me?). Anyway, this week the alert came up with an RCT on the use of IV fluids for alcohol intoxication. This is clearly of interest during the run up to Christmas in Virchester. The Christmas parties have begun and the nights (and days) in the ED are characterised by the inebriated. Many patients are not really ill, just too drunk to go home so a short stay in the ED or on the clinical decision unit results. This takes time and resources so wouldn’t it be fab if we could sober them up faster. For many docs the overwhelming desire to ‘JDS’ (Just Do Something) results in an IV line and a bag or two of IV fluids….., but does this work? Back in 2003 a BestBet published on the topic1 concluded that…. Despite that BET and the lack of any local protocol we still find people hooked up to IVs which may make little difference beyond filling their bladders up enough to precipitate urinary incontinence. This in itself creates even more work for the nursing staff so we really should consider whether it’s worth doing. So, this trial is an appropriate design (RCT) to test the intervention and although single blind (as it would be rather difficult to blind the use of IV fluids) it should still give us a reasonable answer. Patients were given a 20ml/Kg infusion of IV normal saline in the treatment arm of the trial. So, about 1400ml in a 70Kg patient. 144 ED patients were studied which is a relatively small proportion of the 625 patients who presented with alcohol intoxication as a primary diagnosis. Many were excluded on age (<18 or >50), the others on co-morbidities leaving a group of ‘pure’ alcohol intoxications. That’s fair enough but should be remembered when we consider the applicability of the results. Simply put there was no real difference in the length of ED stay. On average there was a difference of 14 minutes which was not statistically significant or clinically important. It is a small study so we should also look at the confidence intervals and these are indeed wide. The 95% confidence intervals for the difference extend from 37 minutes in favour of IV fluids vs 63 minutes in favour of simple observation. There were no significant differences in cost either (though the methods of calculating this were sketchy). Although this is a small study and there are a few methodological issues it is further evidence that IV infusions of fluid in the ED for alcohol intoxication are probably not worth it. Let us also remember that IV fluids are drugs and may lead to harm, and so unless there is good reason to do something then you shouldn’t do it. IV fluids may cost more, make no difference to patient outcome and make life harder for your nursing and domestic staff. So think again, do you really want to do it? Check out Salim’s review on the same subject here345. Conflict of interest – on call tonight and anticipating many Christmas party casualties. 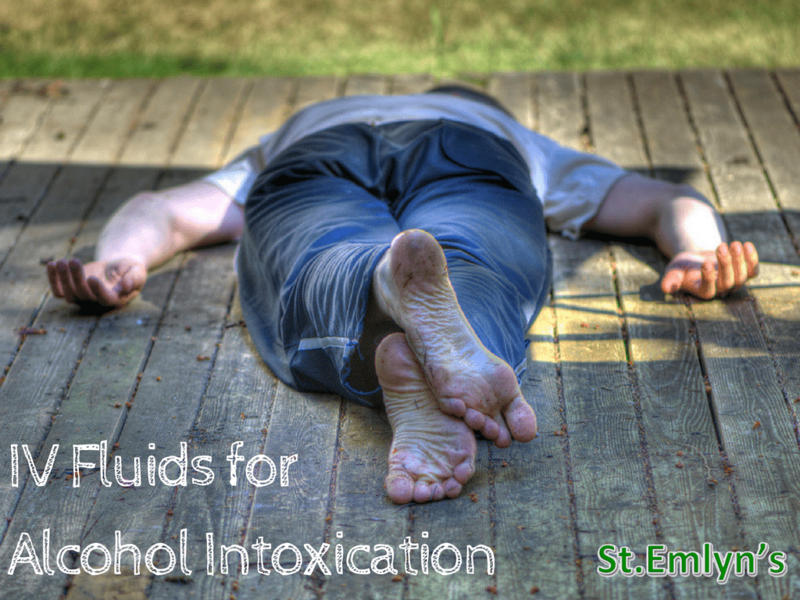 Intravenous Fluids and Alcohol Intoxication. rebelem.com. http://rebelem.com/intravenous-fluids-alcohol-intoxication/. Published May 2014. Accessed September 19, 2016. Would be interesting to see a study look at this with relation to “ingestion” time prior to presentation. I seem to see a lot of heavily laden folk on the up stroke of drunk, makes the 4 hr target tough! I would have been more interested if there is any evidence for IV caffeine than Brine, just from experience; NaCl IV definitely increase the rate of appearance of yellow pool of suspicious fluid on ED floor. walk with caution! Also a pubmed tragic here. I’ve always found that plenty of drunks are controlled with the IV line and bag. “Stay still or *Insert prefered horrible consequence here*” Even in their stupor they get that nurses and doctors saying bad things should likely be listened too. wonder if the large numbers of excluded patients included the violent/aggressive drunks. Good luck with the Xmas party crowds. The few methodological issues pertain to the real world difficulties in doing RCTs in the emergency department and in this case, without a placebo. The other big message that we want to bring across is that we should not be relying on JDS but on good nursing care and observation in an appropriate area. I was one of the emergency nurse working in the department that this trial was conducted in and it was also found, that people actually ended up staying longer in the ED when given IV fluids for acute intoxication, and taking up a valuable ED bed. There was also the problem of having acutely intoxicated people in the ED and the level of violence from these intoxicated individuals and in some cases their friends who accompanied them, that was directed mainly at the nurses, we actually needed to have more security staff in the department when the trial was being conducted. Which leaves me to wonder why intoxicated people are even brought to the emergency dept in the first place, it is a waste of valuable resources. Because there is nowhere else for the ambulance services to put them at present. We should look at Scandinavia (again) and become comfortable with “drunk tanks”. But the society will have to come to term with our (UK and Ireland) drink problem! Over 45yrs general nursing, I say….. Keep them safe from harm and let them sleep it off! Along similar lines, research from closer to home. Interesting the studies you can participate in. No wonder they had 123% recruitment when you read the summary. Sorry for delay responding to this post, but of interest possibly to colleagues suffering from exit block and capacity. Our local psychiatric hospital has made 2 beds available in the detox unit for acutely intoxicated patients – patients are kept safe until sober and then offered alcohol advice & follow up options. Great service! while it does not reduce the time to “recovery”, does fluid administration improve the “quality” of the recovery? i.e. : reduced hangover symptoms?